African Adventure Motorcycle Travel: Having a few friends 'round? Having a few friends 'round? Ihave to mention this PR stunt for the Channel 4 programme Human Footprint. The idea was to produce a number of installations (let's not call it art, although it is artistically done) to represent an average human life's worth of consumption and experiences. 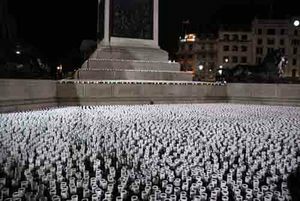 The stunt that got the press interested was nearly 75,000 cups of tea laid out in Trafalgar Square on Tuesday. 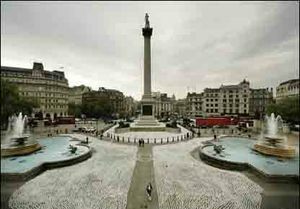 Sometimes it seems anything done in Trafalgar Square gets some attention - remember the banana mountain?